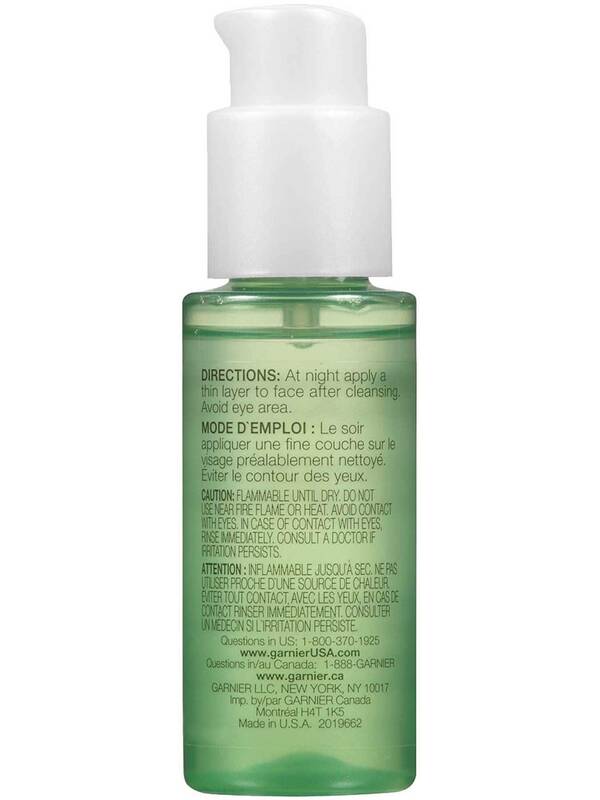 Gently evens skin tone and minimizes the look of dark spots. This gentle, yet powerful leave-on peel with Glycolic Alpha Hydroxyl Acid (AHA) and Vitamin C, effectively evens skin tone and reduces the look of dark spots while you sleep. Wake up to freshm more radiant-looking skin. Use nightly after cleansing. Apply a thin layer evenly to face. Avoid the eye area. Use daily with a Clearly Brighter moisturizer with SPF 15 sunscreen or higher. Aqua/Water, Alcohol Denat., Hydroxyethylpiperazine Ethane Sulfonic Acid, Propylene Glycol, Glycerin, Glycolic Acid, Sodium Hydroxide, Algae/Algae Extract, Ascorbyl Glucoside, Benzyl Alcohol, Benzyl Salicylate, Biosaccharide Gum-1, Hydroxyethylcellulose, Limonene, Linalool, PEG-40 Hydrogenated Castor Oil, PPG-26-Buteth-26, Parfum/Fragrance. 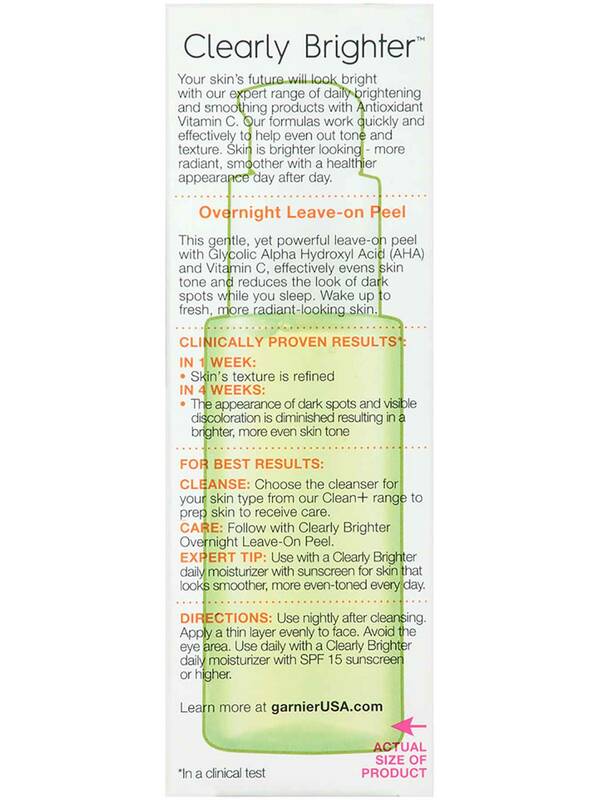 Rated 5 out of 5 by NikkiF87 from Fantastic Clearly Bright Leave on Overnight Peel! 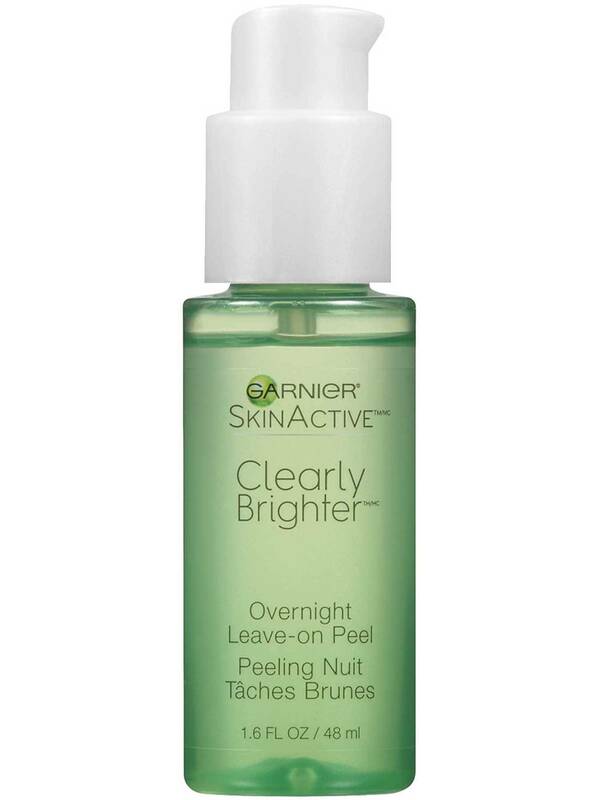 I recently received a free sample of this Garnier Clearly Brighter Leave On Overnight Peel, using this leave on peel was fast an easy! You just apply a thin layer to your face an leave it! As I was applying this I could feel it drying to my skin it wasn't tight or too noticeable it was pleasant, it has a tacky feel to it, its not too sticky though just enough to know it's there an that it's doing its job by protecting an revitalizing my skin while I slept! I went to bed and when I woke up the next day I washed my face an saw fantastic results! After just one use my skin was beautiful! It felt deeply cleaned, vibrantly bright an glowing, and it was soft an smooth! Flawless I dare say! I did notice my dark spots were lighter! My skin was bright and happy! I'm extremely satisfied with this leave on peel! I was blown away by how effective this was after one use! My skin feels renewed an it looks revived! 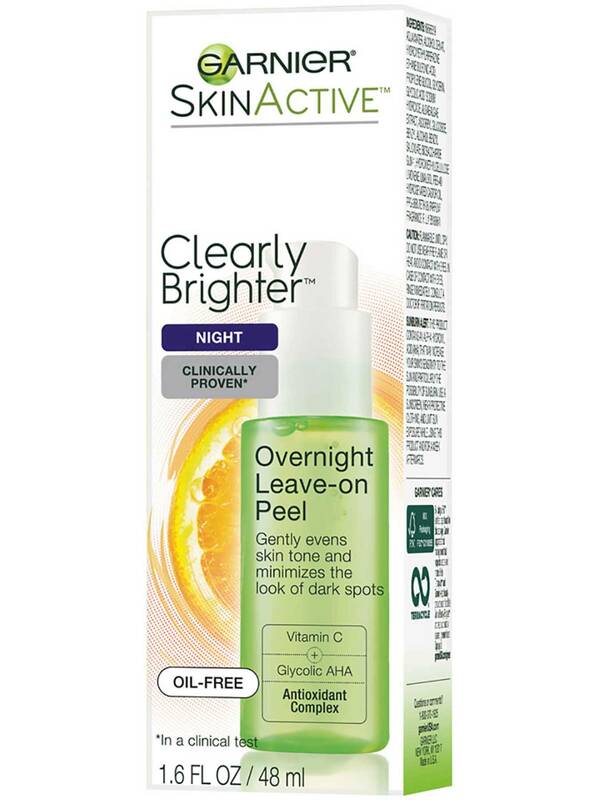 I love this overnight peel an I think you will too! Rated 5 out of 5 by lac3 from Best product EVER I bought this about 2 months ago and I could immediately see the results. 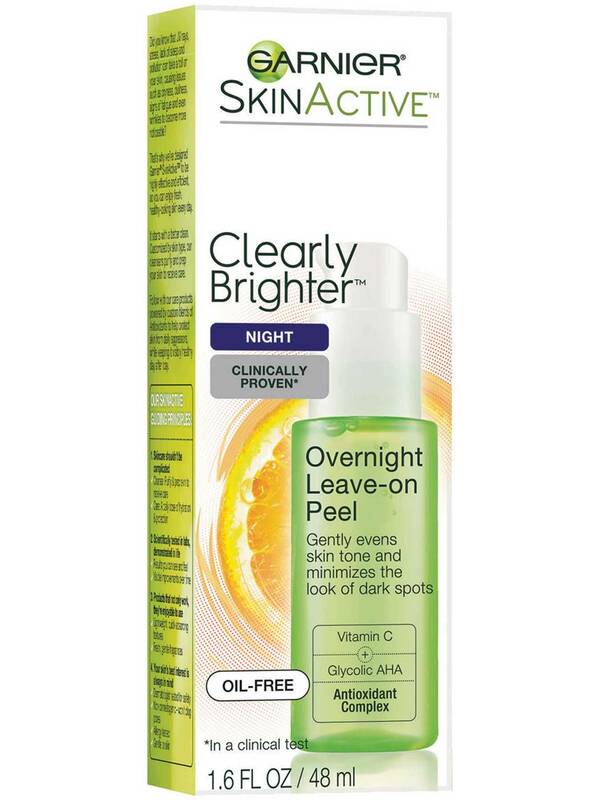 I bought this on a whim from Riteaid (over paid, amazon and target sell it for way less) I was searching for an overnight peel because I wanted to add to my nightly routine. I have several acne scars and this cleared them up beautifully! I still have some but there's no doubt that this product will take those away also with time. This product also helps my skin smooth out and create a more even platform for makeup to shine. I love this product! I just ran out and I am going to buy more today, I can't recommend it enough. P.S. This is not a real peel, when you wake up in the morning it is all gone with nothing left to peel off. Sometimes I feel there is still some product left over so I exfoliate and then it's all gone. I apply this about 10 minutes before I go to bed, with my hair up, by the time I lay down my face isn't wet anymore and the product is no longer sticky. Rated 4 out of 5 by MissStacieS from perfect texture for using as serum This is the 4th bottle I've purchased. I spent too much time in the sun wearing baby oil to tan faster. If only I knew better! Lol. I love the light airy lotion. It feels like a serum & I use it under my moisturizer. It's definitely been helping to lighten my brown spots & uneven skin texture & tone. This is the 2nd bottle of which the pump did not work. Frustrating! Luckily I buy more before I run out so I have a working pump. But you may want to look into that. It's lightweight, glides on, absorbs quickly & has a light scent that I like. Rated 5 out of 5 by Shari77 from Awesome results I had been sick and just let my skin go. I was getting wrinkled and dull skin. I started using Argan Nut Exfoliating cleanser and then over-night leave on peel. I have used for two months now and cannot believe the change in my skin. I am changing my routine to include all Garnier products. They work and are affordable to my limited income. Rated 2 out of 5 by Criss from Nice features Can i ask a question?i have a sensitive skin for season i have darkspot any where in my face small and big but i didnt use creAm because im aftaid if its clogged my pores i just want to get rid of my face problems i have small res bum and i usesd sebum cleansing for hypo allergenic and free oil and its dry my skin face and have white heads?can you help me what should i use cream ??? Rated 5 out of 5 by taytay2167 from try this product it's amazing Leaves skin feeling softer and smoother, I would definitely try again and recommend to family and friends.